The game itself was obviously overshadowed by the shocking news of Gary Speed's death and huge credit has to be given to a number of players on both sides for playing so soon after hearing of the death of someone who they would have worked with or been friends with for a number of years. The game itself seemed to lack a bit of 'oomph' at times which was understandable in the circumstances and although both sides had their chances to win, another 0-0 was no major surprise given the relatively low number of attacking efforts during the match. I mentioned in an earlier blog that 0-0 (or no goalscorer) would be the value bet for most games that the Swans are involved with as we tend to contol games for large passages but are not going to blow away too many teams or get taken apart too often ourselves. 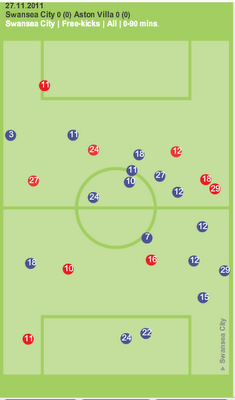 Overall Swansea dominated possession with relatively little cut through only managing seven efforts to Villa's 12. Only 3 efforts were on target in total for the entire game. Numbers relate to squad number of player with the effort. There was a definite feeling that Villa were overly aggressive at times particularly early on when they picked up two bookings in the first fifteen minutes, looking at the free kicks won and conceded by Swansea shows the Swans won 16 free kicks (excluding Offsides) and conceded only 9. 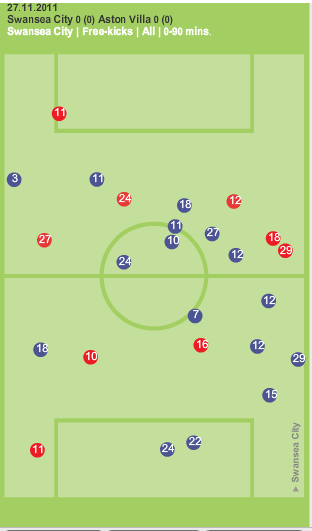 Of those 16 conceded by Villa, 11 were in the first half. Free Kicks won by Swansea (in Blue), focused in the middle third, arguably showing Villa being keen to disrupt moves from developing. ﻿﻿ As well as Villa's fouling, the departure of Rangel before the half-hour mark had an impact on the flow of Swansea's attacks, with the passing of Richards his replacement not being as far up the pitch as Rangel's. 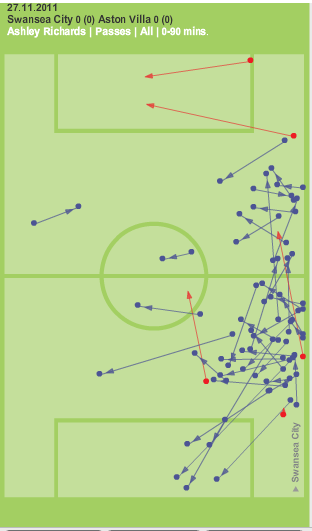 ﻿ Overall though Richards only had five misplaced passes all game, two of which were crosses and one was from a throw in meaning he only made two unsuccessful passes in the whole game. When you have someone come in who is less experienced you naturally focus on their performance more and greater emphasis may be made on any mistake than if the same thing was done by someone else.